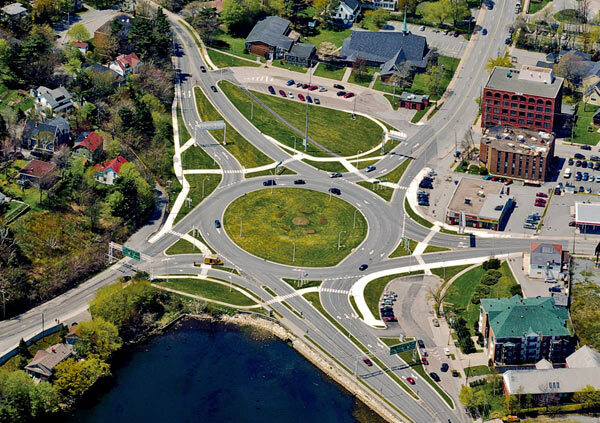 This is a picture of our local roundabout… with no traffic. The boys and I now travel this route on Friday evenings, during the height of traffic, on the way to swimming lessons. Last week I found myself in the wrong lane and had to pull off an impressive feat of merging. It intrigued the kids and a slew of questions ensued. For the rest of the drive, I explained why I had rolled the window down to make better eye contact. I described how I had mouthed, “Can I go?” and pointed in front of the neighbouring car. I recounted how my fellow driver had pointed back and given the thumbs up and that my over-the-shoulder wave had been in thanks… and yes, he had waved back. Glad I wasn’t the only one who saw such beauty in the maneuver. This entry was posted in Funny things my kids say and tagged driving, Family, Funny, humor, humour, kids, Nova Scotia. Bookmark the permalink. Aaaw. I have no idea what this actually means from your child’s point of view, but it sounds like to him, love is a negotiation. I’d have to agree! Now how the heck do I get a link from my blog to your blog? WordPress is killing me with it’s unnecessary complexity!!! How nice that you want to link to me! If you go into “widgets” on your dashboard, you can set up a “links” area. This is where you can link to other pages/blogs that you like. It’s a Punchyish world is it not?